While hosting Weekend Herb Blogging #135, I discovered lots of new blogs. They, in turn, discovered me too. Several of the bloggers graciously invited me to their blog "parties." Except, the parties are vegetarian events, and while I cook with vegetables, and while some of my recipes might be vegetarian-adaptable, "bringing" something with even a little bit of meat just wouldn't be proper. So when Mansi of Fun and Food, who's hosting this month's Monthly Mingle, invited me to share vegetarian appetizers or hors d'oeuvres, I had to wrack my brain for quite a while. Luckily, I remembered that I had recently made Cha Gio Bap/Cha Ram Bap (Vietnamese Corn Egg Rolls). 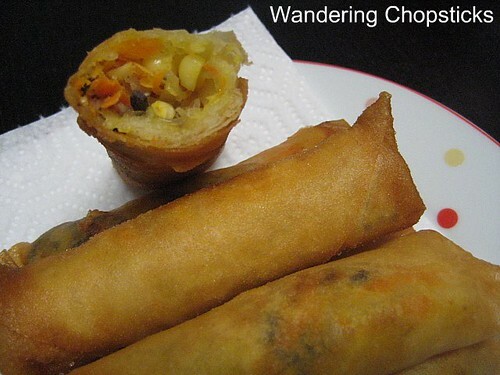 I was more familiar with the pork and shrimp version of Cha Gio (Vietnamese Egg Rolls). And of course, there's my regional version of just shrimp and scallions in Cha Ram (Vietnamese Shrimp Egg Rolls). A few months ago, I lamented on Cathy of Gastronomy's blog about how hardly anyone knows what cha ram were, which prompted Miss.Adventure in Vietnam to visit my blog to commiserate that no one knew about ram bap. 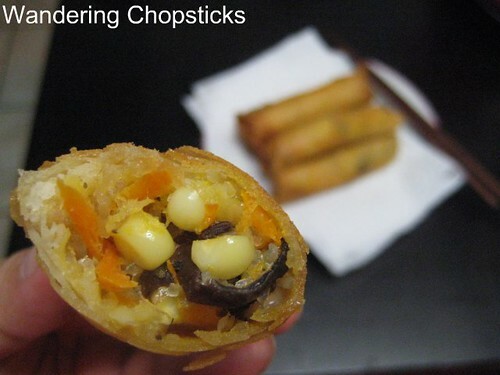 Corn egg rolls? That's new to me. Miss.Adventure says the recipe comes from her mom, who is from Quang Ngai, which is on the south-central coast of Vietnam. 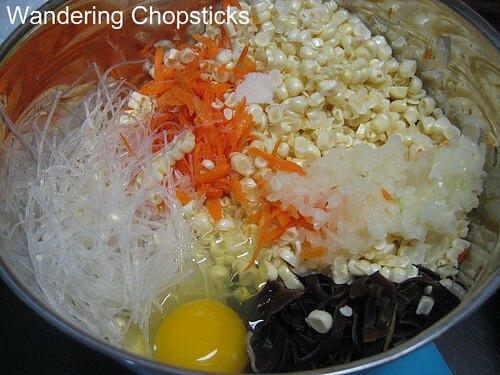 Her recipe included corn, bean thread vermicelli noodles, wood ear mushrooms, and salt and pepper. Since my ong ngoai (Vietnamese maternal grandfather) is also from Quang Ngai, I called my mom to ask if she knew about ram bap. She said she did and that people in our hometown ate it too. Huh! Who knew? Mom suggested I slice off the corn in layers, like how I make Che Bap (Vietnamese Corn Pudding) with Tapioca Pearls in Coconut Milk). This is important since you don't want whole corn kernels. 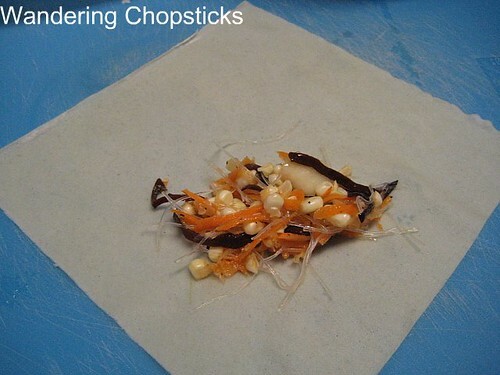 The inside of the sliced kernels become sticky, which helps to bind the filling as there's no meat. I decided to also add in grated carrots and onions, and an egg for binding, like I do in normal cha gio. 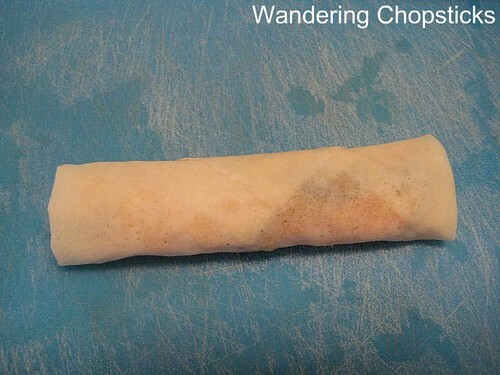 The result was a very light, yet filling egg roll. The cooked corn provided a slight sweetness. I didn't miss the meat at all. Anyway, Miss.Adventure in Vietnam says her mom calls these corn egg rolls ram bap, but that I can also call them cha gio bap, which probably has a more familiar ring for people. 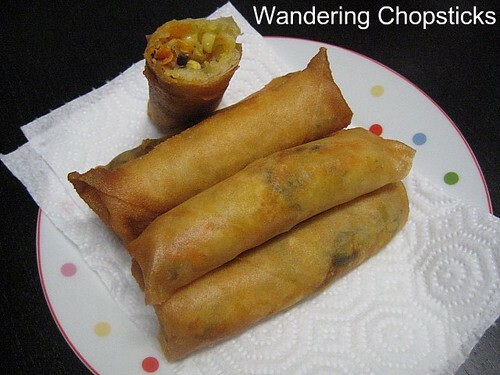 Also, please check my cha gio recipe for rolling and frying tips. Since there's no meat, the filling can keep in the refrigerator for about a week. 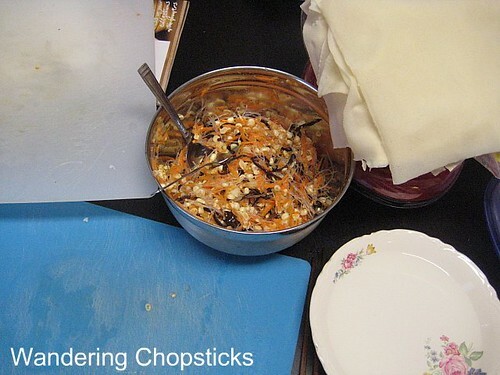 Just make however many egg rolls you plan to eat right then as they'll get soggy. Store the filling in a tight container in the fridge, or freeze the filling for later. Soak wood ear fungus and bean thread vermicelli noodles first. 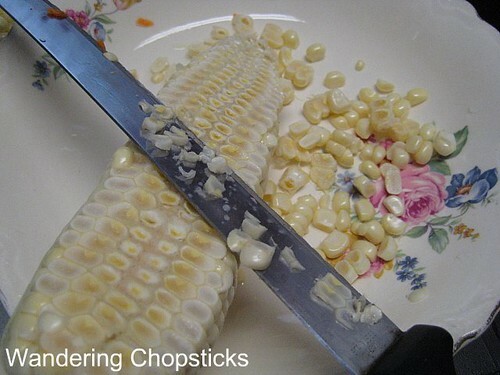 While they're soaking, slice off corn kernels in layers like so. Peel and grate one carrot and one onion. Drain and squeeze out excess moisture, and add in bean thread vermicelli noodles and wood ear fungus. Add one egg for binding. Add 1/2 tsp salt and 1/2 tsp ground black pepper. And mix thoroughly. 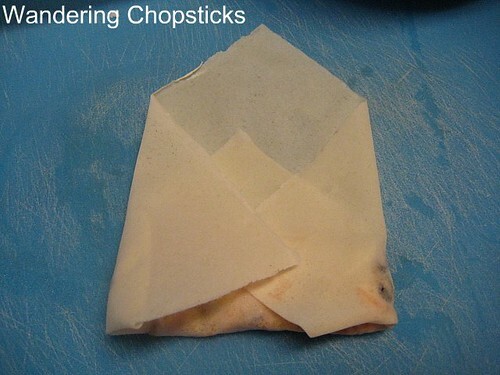 Set up your rolling area - separate wrappers, have your filling ready, and a bowl of water for sealing the wrappers. Don't be too greedy, we're not making burritos here. Scoop out about 1 or 2 tblsp of filling and place it near a corner. Fold the corner down, notice how I tuck it under a bit? 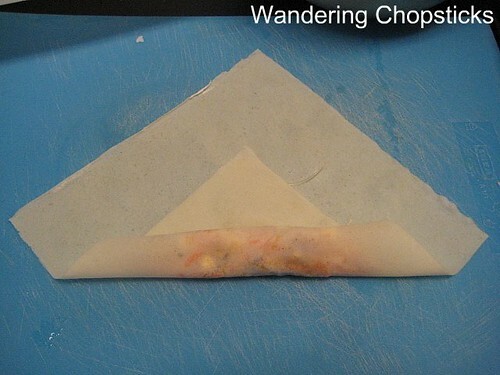 Then fold in the sides. 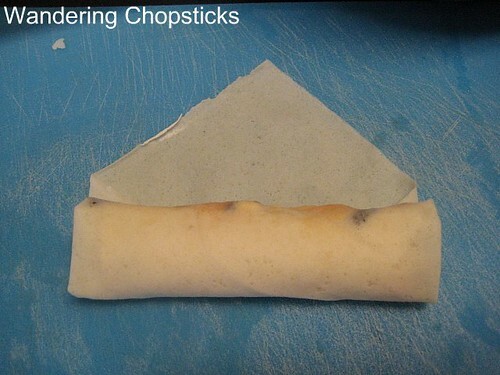 Make sure it's straight so the sides of your egg roll will be even. Roll and make sure it's tight. Keep going, making sure it's still tight. When you get near the end, you can dip your finger in the water and moisten the corner. 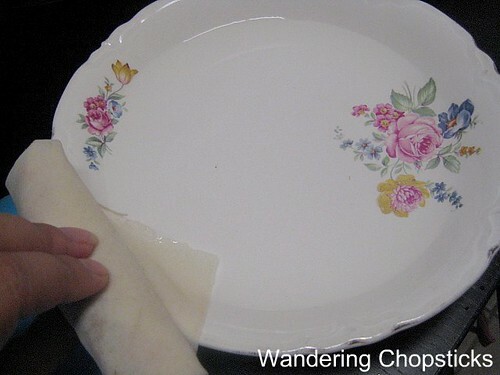 Or take the whole egg roll and dip the corner into the water. 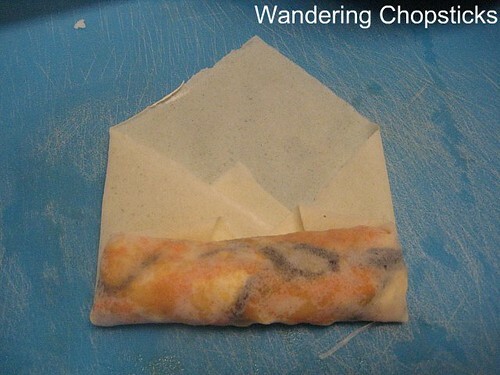 Finish rolling and you've got a tightly-wrapped egg roll. 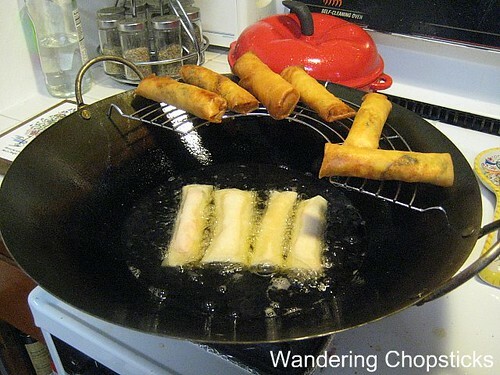 This is important because it keeps excess oil from dripping into the egg roll when you're frying. Add a tsp of white vinegar into the oil for extra crispiness and turn your wok or frying pan to medium-high heat. The oil is hot enough when a wooden chopstick in the oil forms bubbles. Fry egg rolls until golden. These may be eaten alone or with a simple Nuoc Mam Cham (Vietnamese Fish Dipping Sauce). I'm submitting this recipe for Monthly Mingle, an event started by Meeta of What's for Lunch Honey? This month's host is Mansi of Fun and Food, and the theme is vegetarian appetizers or hors d'oeuvres. 1 year ago today, Chao Tom (Vietnamese Grilled Shrimp Paste Wrapped Around Sugarcane). Looks perfectly delicious! I was actually planning on making them this weekend! I've never heard of these before - they look awesome and I want some! I've made vegetarian cha gio with taro with so-so success but I love the sweetness and moisture that corn would add so I'll have to give these a try one of these days. Thanks for inviting me to the party. And making me wrack my brain for some vegetarian recipes. Oooh, do post about it. I'd love to see how you do it. And I can link your recipe to my version. I've heard of people adding grated taro for a veggie version but haven't actually tried it myself. I liked these a lot. hey! You need to make a vego nuoc mam lam (what my family call your nuoc cham). My eldest sis is a vego and I was, too, for about 6 years. We made nuoc mam lam chay by replacing fish sauce with soy sauce and upping the amount of lemon (or using orange juice instead). Actually, I almost always use orange juice mixed with lemon juice when making nuoc mam lam. 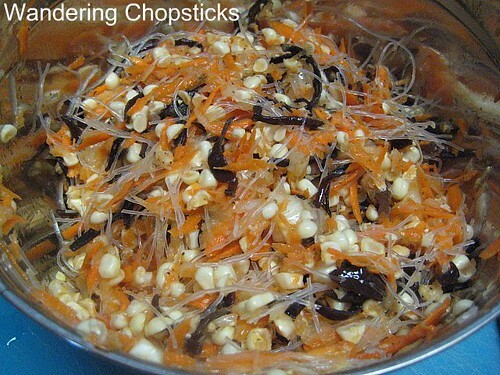 I've also made vego cha gio chay with green beans, cabbage, carrot, wood ear, and bean-thread vermicelli. Going to have to give adding corn a try! I love corn! miss.adventure will be bringing corn eggrolls to my dinner party (Hawk is bringing booze)! Jealous? We'll eat a couple in your honor! Wish you were here! Very very cool idea! I love this post, WC - a little of what happens outside blogdom, inspired by bloggers. I love corn too. You know there's vegetarian nuoc mam? I don't know what it's made of, but I remember seeing it. Sometimes I add kalamansi orange juice in my nuoc mam cham. Nicely tart and sweet. It's yum! These look great, especially with corn! My Ba Ngoai first made me a corn and mung bean fried roll back in 1995 and I've been hooked ever since. The timing was perfect because that was during the peak of my vegetarian days. I would eat these with a vegetarian muoc cham made from sugar cane juice to imitate the amber color of nuoc mam. I learned this from a friend of mine who worked in a Viet vegetarian restaurant. Every time I corn in these type of rolls I think of her and miss her tremendously. Thanks for reminding me of these and of her. I need to write her another letter.